OK, I get it, really. People would much rather see pink hibiscus bushes in planters than protesters in tents. And I would much rather live in a prosperous and happy community than a poor and contentious one. Where I disagree with Mayor Caldwell is that I think the way to build a prosperous and happy community is to help the community become prosperous and happy. I know, easy to say, hard to do. 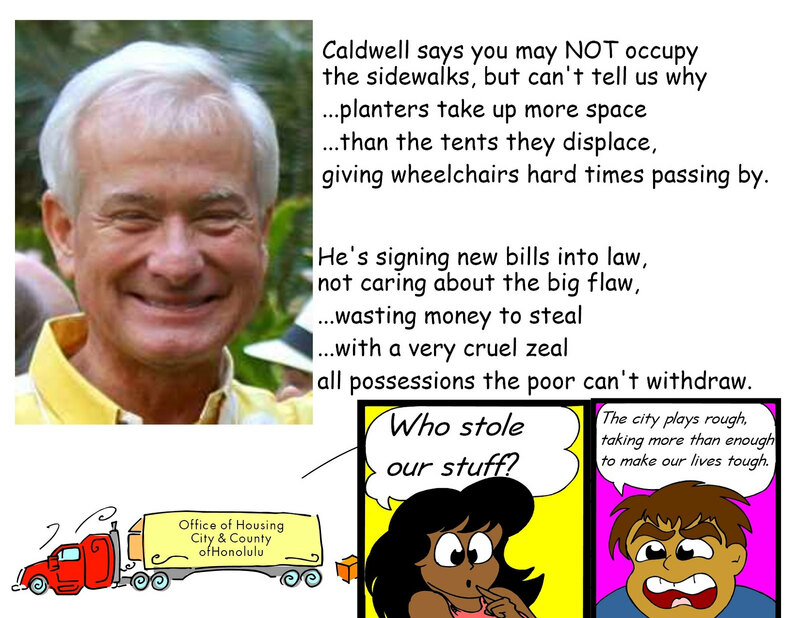 Mayor Caldwell and the Honolulu City Council take the easy (and I say low) road: make being poor a crime and just simulate the appearance of prosperity. There's bound to be some glaring evidence of inauthenticity when you do things that way. When you go to Disneyland and see Mickey Mouse, you'll have to notice that his smile is permanently sculpted into his mug. He can't frown (and if he did he'd get fired). The City used armed police to take the possessions of protesters and the homeless and kick them off the sidewalk. Then they put up 65 planters along the sidewalk. What you can't see in this video is the more recently constructed fence along the other side of the sidewalk allowing for what I would eyeball as the exact 36 inches required under ADA regulations. Of course, that means that when a wheelchair coming from the Ward end comes upon another coming from the Victoria side -- well, it's a Robin Hood meets Little John situation. Neither can pass or turn around. Nice job! You can't just simulate the appearance of prosperity and happiness using a Disneyland Maginot Line of hibiscus planters. Reaction to this has been swift. Larry Geller in an article in Disappeared News points out that the City "believes that by doing things to homeless people it is solving a problem, while so far avoiding doing anything for homeless people that would help solve their problem." And I'll have more to say in a day or two, for sure. Sometimes I wonder if you guys didn't set up camp there, if they would even bother doing anything to the homeless that were there before you. Honestly, the deOccupy Kakaako camp has been going strong for years. There is no deOccupy Kakaako. deOccupy Honolulu is in solidarity with Occupy Wall Street and was started on November 5, 2011. The more than 70 raids it has weathered were mostly raids that were also conducted on other homeless encampments in urban Honolulu. Often the dump trucks used on these raids show ample evidence of crunched tents, clothing, and survival supplies. So to answer your question, deOccupy Honolulu did not precipitate the raids on the homeless. The other camps have it much worse.